I have a complicated history with Vikings. Until I wrote Twilight Empress, they were blood-thirsty raiders who raped and raided Europe in the middle ages and “discovered” the New World well before Columbus. Like most people, I developed this attitude based on movies and TV shows and didn’t look too closely at any data that contradicted the stereotype. As I studied more deeply—particularly the Scandinavian influence in the fifth century (pre-Viking Age)—I found a much more interesting history of a complicated society of farmers, traders, warriors, and—of course—raiders. I was also surprised to find that Vikings and Goths were related. In my studies for Twilight Empress, I learned that the Goths who raided Rome in AD 410, established a kingdom in Spain and southern France, and toppled the last Roman Emperor in 476 were most likely Scandinavians. They probably migrated from their Swedish homeland to Poland in the second century, then to the area north of the Black Sea. The advancing Huns pushed them into the Roman Empire in the fourth and fifth centuries laying the ground work for the “Fall” of Western Rome. (Eastern Rome centered in Constantinople morphed into, what is now known as, the Byzantine Empire and lasted another thousand years.) I used this background in all my books set in the fifth century. The need for this research led me to accumulate several reference works including Vikings and Goths: A History of Ancient and Medieval Sweden by Gary Dean Peterson. The title is bit misleading. I would have called it “A History of Ancient and Medieval Scandinavia” because he roams far beyond Sweden. The author covers a significant time span from the Ice Age to the end of the fourteenth century, which means some chapters are more overview than deep dive. Perterson lays out geological, archaeological, and literary evidence for his conclusions that Scandinavians had a significant influence in Europe. They built extensive trade networks along river routes in the east; established kingdoms in France, England, Russia, and Sicily; and colonized Iceland, Greenland, and—briefly—Vineland. Overall, I liked the organization and content of the book. It is dense with well-organized information and extensively-documented with notes, useful illustrations, maps, and a comprehensive index. My one problem with the book is the design (which did not influence my assessment of the content—authors usually have little control over design). At 10 inches by 7 inches, the book is a bit too big to hold comfortably in your hands. With regular type, this width requires your eyes to travel across the page rather than take a line in at a glance, so it is tiring to read. I felt the designer was trying to keep the page count down, so the publisher wouldn’t have to charge a higher price. In addition, I thought the cover was amateurish—especially the choice of fonts. In this case, please don’t judge the book by its cover. 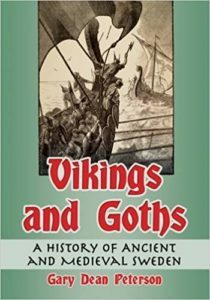 In conclusion, I recommend Vikings and Goths for researchers and dedicated amateurs. It’s packed with great information. More casual readers might find it a bit tough going. PLEASE NOTE: I received this book through an Early Reader Program in exchange for an honest review.